The French for characterize, mark is the regular ER verb caractériser. ...imagine the French flag is CHARACTERIZED by the French character, Napoleon! - se caractérizer (vr): to assume, take on the character; become clearly marked; to be distinguished by (par). - le caractère (nm): character, symbol, type; personality, spirit, grit. - caractéristique (de) (adj): characteristic, typical, distinctive (of). Use French characters to characterize vocab which is simliar in French and English. Find proven techniques like these in the Cartoon Memory Triggers. To remember a word, just think of the pic! 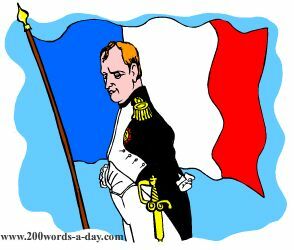 Imagine the French flag is CHARACTERIZED by the French character, Napolean! characterize! caractérise ! caractérisons ! caractérisez ! ✔ caractériser is a regular ER verb. There are over 5,000 ER verbs these being the most common verbs in French. ✔ Learn caractériser and it will reinforce the pattern for ALL those other ER verbs. ✔ You can more easily remember words and verbs like the French verb caractériser - French for for characterize, mark - using the techniques of the world's Memory Masters. 200 Words a Day! Free Daily French Lesson Online - the verb in French for characterize, mark is caractériser - fully conjugated. French Learning Made Fun and Fast with your free Daily French Verb Lesson - caractériser.